Does Tourism Activities Stress Tigers? One of the claims is that tourism is adding stress so that the tigers in the tourism zone are reproducing less or nil in many cases. One of the immediate effects of stress is a reduction in reproduction but this data won’t stand ground and is baseless if you claim this without data. One has to do with a through data analysis showing how the birth rate has declined over a substantial period of time compared to how it has done in the non-tourism zone. We lack this data completely and in fact, there exists no data. 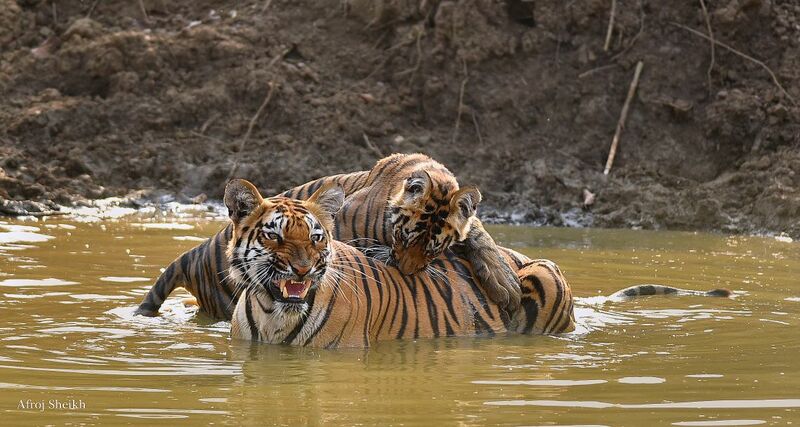 Contrary to the claim, there are very good number of litters have happened in the recent years in tourism zones of Bandhavgarh, Tadoba, Pench, Kanha and elsewhere across India while in the same period there is a growth of more than 20% in the wildlife tourists number and in fact says the contrary which is “Tiger Growth is more when there is more tourism” then again these are wrong conclusions and just one set of data should not be used to conclude such irrational conclusions without deep study and more datasets. There are various reasons, better conservation strategy, better anti-poaching activities and also in a way more tourism means more watching eyes and hence more deterrent for poaching and better survival as well as reproductive stats. While we don’t believe this scientist’s conclusion of tourism industry stressing tigers with the wrong and with so minimal set of data, let’s see what the international & renowned scientists feel what activities cause stress to animals. What Activities causes Stress to Animals? According to University of Oxford’s Wildlife Conservation Research Unit’s paper, activities like cuddling tigers, riding elephants, and orca whale shows etc are the ones which are more harmful and creates more stress. In fact, they highlight the plight of elephants riding and elephant domestication as the highest and we should probably stop that first, especially those which are used in temples. Also the kind of tiger tourism you see in the Thailand Temple, which is harmful as well as stressful for the animals. In a new World Animal Protection report, elephant rides and tiger selfies are the cruelest animal tourist attractions causing a lot of psychological issues for the animals. Recently, wildlife researchers have begun using lie-detector technology—very lightweight ECG or heart monitoring equipment—in an attempt to find out just how stressful it actually is for wild animals to be in the presence of humans. Some of the preliminary results show that even when creatures make no attempt to flee, their heart rates shoot way up, indicating that we may be, well, scaring the tar out of them. In the most recent—and very preliminary—study, published in the online scientific journal PlosOne, researchers compared the heart rates of a pair of koalas exposed to frequent tourist visits with those of a koala that seldom saw people. Results indicated that in the koalas visited by humans—and in spite of their outwardly placid demeanor—heart rates increased during the time of day when people were around. Further, the researchers found that when they walked directly beneath a tree in which the animals were located, their heart rates shot up significantly. By contrast, the koala that was left alone did not show striking variations in its heart rate. ECG studies of some nesting birds—Adelie penguins and giant petrels—also show an increase in heart rate when humans approach despite an apparent lack of concern on the part of the bird. Of course, some stress is a normal part of life for most wild animals. And in a lot of cases, ecotourists provide important funding for the conservation of species that otherwise would be at the complete mercy of people and industries whose intentions are far less benign. Also, The important questions are, how much stress is too much, and how much stress can ecotourists safely add to a creature’s normal stress load without affecting its health, its well-being, or the integrity of its habitat? Many answers, of course, depend on which species you’re talking about. Science needs to continue gathering data about how much stress various species undergo in the presence of humans, as well as how much they can, or should, handle.